From the time of its first appearance about 4,000 years ago, the sword soon became the pre-eminent weapon of personal defense and has been a preferred vehicle for technological and artistic expression even since its relatively recent decline. 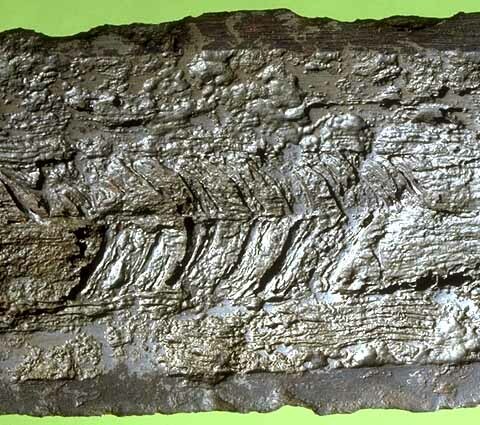 Within what at first seems to be merely a simple variation of that basic tool, the inclined plane, metallurgical studies have revealed complex piled structures in iron swords dating from as early as Celtic times13 (500 BC). Being composed of several rods welded together and running the length of the blade, such piled structures allowed the smith to localize desired properties by empirically joining together irons with differing properties owing to different origins and concentrations of trace elements. Additionally, small rods could be carburized to increase hardness by increasing carbon content. Ideally, steel (which is an alloy of iron with small amounts of carbon) would be chosen to provide hardness at the edge. However, since an increased carbon content concomitantly causes brittleness, softer and more malleable wrought iron or mild steel is better used for the remainder of the blade in order to impart resistance to fracture. Piled construction provides another advantage in that it averages the strengths and weaknesses of the individual components. 1. Detail of the blade of a Celtic sword from the 1st century BC, in an area presumably bent prior to inhumation and later straightened. Differential corrosion discloses separate elements for the cutting edges and vague linearity parallel to the long axis suggests piled construction. A parallel stress fracture is seen to the left and may be along a welded boundary (Private collection). In the pattern-welded sword blades made from the Migration Period through the mid-Viking Age (5th through 10th centuries), swordsmiths manipulated the piled structure of the blade to create a striking decorative effect. Virtually all existing swords from these times are in excavated condition and in many cases weak acidity in the earth or water has differentially etched the blade surfaces and the presence of complex geometrical patterns integral to the substance of these European sword blades has long been recognized; the lithographs in the survey of Norwegian Viking swords in the Bergens Museum by Lorange8 from 1889 remaining unsurpassed in their beauty and clarity. In the earlier part of this century, some academics proposed impossibly complex explanations of the "lost art" of forging these patterns, although the basic techniques of pattern-welding had, in fact, on the factory floor, remained in use into this century in the forms of Damascus shotgun barrels and in Solingen's production of presentation grade sabers and daggers, including those of the Third Reich14. Essentially identical pattern-welding techniques are also commonly encountered in near-Eastern weapons such as yataghans, kindjals and quaddaras as well as in Indonesian krises. Herbert Maryon introduced the term pattern-welding in 1948 in conjunction with a sword found near Ely and in 1960 published a detailed account of the pattern-welding process9. J. W. Anstee1, Lena Thålin-Bergman15 and Jaap Ypey18, among others, have made further contributions in this field, with the metallographic studies of R. F. Tylecote and B. J. J. Gilmour16 and the radiographic studies of Janet Lang and Barry Ager6 being the most significant recent works. Essentially all of the patterns identified in these weapons may be built up from rods composed of several, frequently seven, alternating layers of varyingly dissimilar irons (varying depending upon trace elements inherent in the ores of origin) welded together. Depending upon the ultimate pattern desired these rods would then be twisted either to the left or right or allowed to remain straight along the length of the rod. Rods with matching or complementary twist patterns are ultimately installed side-by-side into the sword blade. Grinding away the outer surfaces of such rods discloses a predictable evolution of patterns which may be further varied by flattening of the rod before it becomes welded to its neighbors in the fabrication of the central portion of a sword from several such rods. Figure 2 details the evolution of the patterns as progressively more of the face of a twisted rod is ground away, diagonal patterns of roughly parallel lines being from the periphery of a rod and curved patterns coming from progressively deeper sections until the middle is reached, at which point a square checkerboard pattern emerges. Phosphorus rich iron, which remains lighter in color when exposed to mildly acidic etching agents, was sometimes employed to increase the contrast of the layers within a rod. 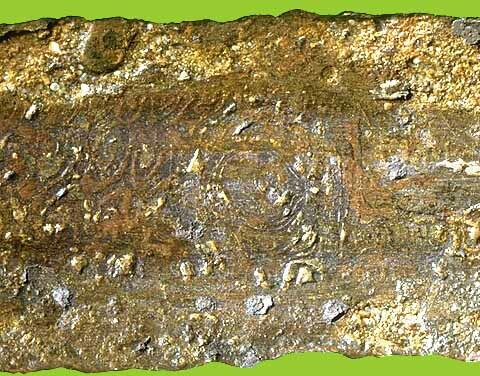 Variations in carbon content also play a role in the etched appearance and patterns will emerge to some degree even when similar iron is used in all parts of the sword, owing to slag inclusions and trace elements added by the flux used in welding. Nickel alloys are most commonly employed to enhance contrast in modern work. 3. Pattern variations shown in clay models prepared by bladesmith Dan Maragni. A. Successively ground, left to right, twisted rod with sixteen layers. B. Successively ground, left to right, twisted rod with eight layers. C. Twisted rod, subsequently flattened. The pitch of the twists creates a pattern resembling that seen in some of the Nydam swords. 4. Detail of a yataghan blade, probably 18th or 19th century, showing three bands of pattern welding, exposed to varying depths generally between 25 and 50% of the rod thickness. The blade is relatively thin except for a ridged back and differences in the courses of the bands hint that there are three separate strips applied to each side and that the pattern-welded rods may have been flattened considerably (Private collection). Radomir Pleiner's The Celtic Sword13 provides a comprehensive survey of early ferrous swords and documents wide variations in blade construction and quality. While Celtic smiths may not have used their materials effectively in many of the blades Pleiner studied, he found that in just over fifty percent of the swords steel was present in at least one cutting edge. While occasional twisted strips are seen in the piled structures of swords dating from the late La Tène period (1st century BC to 1st century AD), true pattern welding becomes evident from about the 3rd century AD in swords from the peat bogs at Nydam in northern Germany, reaches its zenith in terms of complexity in the 6th and 7th centuries and is generally out of use by the end of the 10th century. Blades of the Migration Period (5th and 6th centuries) and of the Vendel (or Merovingian) Period (7th and 8th centuries) average 71 to 81 cm. in length exclusive of the tang and between 4.3 and 6.4 cm. in width, with the majority falling into the narrower end of the range and not exceeding 5.6 cm. in width. The edges of these swords tend to be parallel or with minimal taper towards a spatulate point. The faces of the blade are often flat and the central flat portion is pattern-welded, with the edges and tip being of non-patterned steel. The swords of the Viking Age evolved from these with the average blade length remaining relatively constant at about 78 to 81 cm. excluding the tang. A change in the overall shape of the blade gradually occurred such that the degree of taper increased slightly, bringing the balance point closer to the hilt. Also, the swords became slightly heavier and a shallow fuller on each side of the blade became increasingly pronounced during this time. 5. Detail of a winged spearhead, 9th century Carolingian type, showing remains of two thin bands of pattern welding of diagonal form, forming a chevron, overlying a base of non-patterned metal. Wide bands with relatively straight pattern are frequently thin, suggesting much flattening of the rods (Private collection). 6. Detail of a double edged sword, 9th century. On the left, the center of the blade is made up of three twisted bands, the center band twisted opposite to those beside it, forming a herringbone pattern. On the right, all three bands straighten. Along the entire 74 cm. length of this blade, there are seven such alternations on each side with straight areas opposite the twisted areas on the other side of the blade, indicating that the central patterned area is made up of at least six rods (Private collection). 7. Detail of a double edged sword, 8th to 9th century. The central portion of the blade is composed of four bands of pattern-welding and shows straight areas alternating with pattern consistent with being from the center of the rod. As areas of corrosion not pictured disclose a central plain core, the blade contains a total of eight patterned strips. To the right of the center, perpendicular to the long axis a stress crack is seen crossing the bands; the other layers of the blade appear to have better withstood the stress (Private collection). Pattern-welding in these swords usually consists of two to four bands in the central flat or fullered face of the blade running from the base of the blade adjacent to the hilt to within a few cm. of the tip. Many swords show complicated patterns of twisted bands alternating with straight areas, and almost every imaginable combination can be found in the archaeological material. The pattern disclosed by radiography of the Sutton-Hoo sword is that of four bands, alternatingly twisted and straight and with the direction of twist reversed between adjacent bands and the entire pattern repeated on the opposite surface of the blade except that the straight areas are opposite the twisted on the other surface, and is a commonly seen pattern. One of the swords published by Leppäaho7 from the National Museum in Helsinki (NM 2022), dated to the 8th century, displays numerous patterns, the plainer side nearest the hilt showing three bands, each about 0.7 cm. in width having diagonal twists characteristic of the peripheral section of a twisted rod forming a herringbone (or chevron) appearance and alternating with straight areas of non-twisted rods. The diagonal areas evolve into a curved pattern characteristic of about 25% of the rod having been ground away in the mid portion of the blade, beyond which the pattern rapidly transforms into two bands, each 1 cm. in width, forming a checker-board pattern characteristic of the center of a twisted rod for a few centimeters before again resuming a curved pattern without the presence of alternating straight areas. The pattern on the opposite surface of the blade begins as two bands of curved pattern, each 1.3 cm. wide, adjacent to the tang. A zone of corrosion obscures the pattern in a zone several centimeters from the tang, just beyond which two inlaid iron strips perpendicular to the length of the blade and covering the fuller are seen. Beyond this, three bands of diagonal (herringbone) pattern alternate with straight areas until the mid-portion of the blade, where the central band lifts above its adjacent companions and transforms into a wavy serpent-like inlay alternatingly covering the remaining two bands and what appears to be an untwisted rod in between as it makes its undulations approaching the tip. 8. Cross-sectional diagrams of typical sword blades from the Migration Period through the end of the Viking Age. A. Blade with three pattern-welded rods as its core and with steel edges; a. depicts low carbon iron and b. depicts contrasting iron frequently containing phosphorus in order to enhance pattern clarity. B. Blade with core composed of six pattern-welded rods; intermediates between A. & B. have been documented to exist16. C. Blade with three bands of pattern-welding on each side, separated by an iron core; this construction pattern is very commonly encountered. D. Blade with four bands of pattern-welding on each side, an iron core, and separate steel rods for the edges. 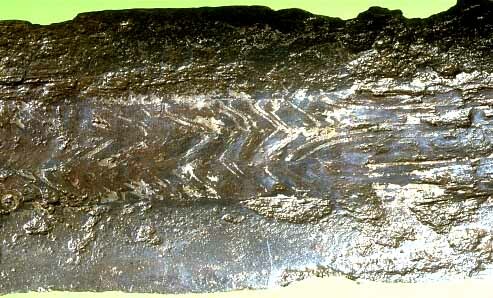 Metallographic studies frequently show the edge sections to also be of complex composite structure16. E. Representation of an ULFBERHT style blade, after Williams17, which is built up from a complex piled structure, with steel in the edges and the lowest carbon concentrations at the core. The small c. depicts vestigial pattern welding, being a thin inlay forming the smith's name or geometric patterns. Just as many variations are seen upon the surfaces of these blades, cross-sections are also quite variable throughout the period. Blades with one layer of pattern-welding, visible from both sides, appear to be less common than blades with two layers (one on each face) or with a further central layer of plain ferrous metal as a core in between which may well represent the most common pattern. Swords having some full thickness bands side by side with bands making up only half of the thickness are also known. Lang and Ager discovered that the curving patterns were rare in the British material, suggesting that the fullers were forged in Britain instead of being ground out as specimens from the remainder of Europe suggest. 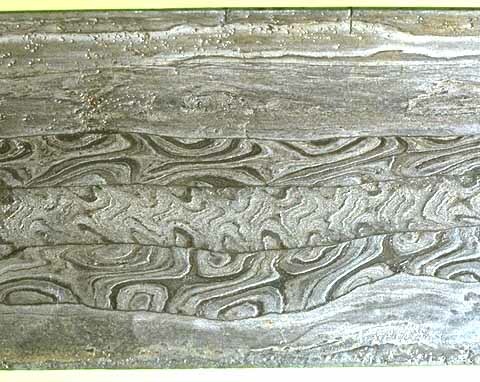 Many authors conclude that twisting of rods may have excluded slag, allowed a higher carbon content throughout (when the rods were carburized) and distributed strength and weakness throughout in a manner analogous to modern plywood, allowing stronger swords than would have otherwise resulted. Late pattern-welded blades from the continent may have a thin veneer of pattern welding over a more homogeneous iron core, suggesting that, while pattern-welding may have evolved as a consequence of the piled structure seen in the Celtic sword, in the end it was a decorative process. 8a. Detail of a double edged sword blade found in the Netherlands showing background curved patterns on the left, consistent with a plane of section nearing the centers of the composing rods, and having a central circular overlay in iron, to the right of which is another overlay perpendicular to and overlying the fuller; probably 8th or 9th century. (Private collection). 9. Detail of an +ULFBERHT+ inscription and geometric designs on the opposite face of the blade, 10th century. Notice the patterns within the twisted rods used to form the inlay. (Private collection). Pattern-welded blades continued to be made at least into the early 10th century, however, over the course of the 9th century, twisted iron inlays forming letters, symbols and geometric designs came to predominate. Lang and Ager's6 survey of the British material failed to disclose swords with both a pattern welded structure and iron inlays, however such swords are not uncommon in the continental material. The iron inlaid inscriptions may take the form of names, ULFBERHT and INGELRII are the most common; the occasional association of these names with the Latin ME FECIT indicating these are maker's names. As these names remained in use for a couple of centuries as inlays, they may better be regarded as trademarks intended to indicate the workshop which produced the blade. The incredible degree of variations in letter formation and spelling would suggest that if the trademark hypothesis is correct, rampant counterfeiting prevailed. For the blades with inlaid names, a geometric pattern is often seen on the opposite blade face. Inlays of circles, lines and curved symbols are also commonly identified. The inlays, hot forged into the surface of the blade, are often formed of twisted iron wire similar to the rods which had formerly made up pattern-welding; phosphorus rich iron again sometimes being employed to increase the contrast. By the second half of the 11th century, the iron inlaid smith's name trademarks and symbols have been replaced by iron inlaid inscriptions, often not pattern-welded, and most commonly consisting of various corrupted spelling of IN NOMINE DOMINI, equivalent to the modern "In the name of the Lord," probably not entirely coincidentally fitting for an era which saw the earliest of the Crusades. 10. Detail of a the ending portion of a variant of an IN NOMINE DOMINI inscription, 11th century; the inlaid letters are not pattern-welded. (Private collection). The author would like to thank Judy Gray, Fran Morano, Sylvia Oliver, and Doug Whitman for their assistance in the production of the illustrations, Dan Maragni for slaying many inaccuracies in the early drafts of this article and for preparing the models of the twisted rods, owners of the illustrated items, and, of course, all of those who have researched and written upon this and related subjects in the past, who regrettably are only partially represented in the notes below. 1. Anstee, J.W. and Biek, L., "The Forging of a Pattern-welded Sword," in Davidson, H. R. Ellis, The Sword in Anglo-Saxon England (Oxford, Oxford University Press, 1962) p. 217 - 224. 2. Behmer, Elis, Das Zweuschneidige Schwert der Germanischen Völkerwanderungszeit (Stockholm: Tryckeriaktiebolaget Svea, 1939). 3. Davidson, H. R. Ellis, The Sword in Anglo-Saxon England (Oxford: Oxford University Press, 1962). This work has been available in a corrected reprint since 1994, published by the Boydell Press, Woodbridge. 4. DuChaillu, Paul B., The Viking Age (New York: Charles Scribner's Sons, 1889). 5. Geibig, Alfred, Beiträge zur morphologischen Entwicklung des Schwertes im Mittelalter: Eine Analyse des Fundmaterials vom ausgehenden 8. bis zum 12. Jahrhundert aus Sammlungen der Bundesrepublik Deutschland (Neumünster: Karl Wachholtz Verlag, 1991). 6. Lang, Janet and Ager, Barry, "Swords of the Anglo-Saxon and Viking Periods in the British Museum: a Radiographic Study," in Hawkes, Sonia Chadwick, ed., Weapons and Warfare in Anglo-Saxon England (Oxford: Oxford University Committee for Archaeology, 1989), p. 85 - 122. 7. Leppäaho, Jorma, Späteisenzeitliche Waffen aus Finnland: Schwertinschriften und Waffenverzierungen des 9. - 12. Jahrhunderts (Helsinki: Suomen Muinaismuistoyhdistyksen Aikakauskirja Finska Fornminnesföreningens Tidskrift, 1961). 8. Lorange, A. L., Den Yngre Jernalders Sværd (Bergen: John Griegs Bogtrykkeri, 1889). 9. Maryon, Herbert, "Pattern-welding and Damascening of Sword-blades: Part I - Pattern-Welding," Studies in Conservation 5 (1960), 25 - 37. 10. Oakeshott, R. Ewart, "Medieval Swords - Part III: The Sword of the Migration Period," Gun Report (December 1985, p. 18 - 23). The other installments of this series of articles were published in the same periodical as follows: September 1985, p. 18 - 22; October 1985, p. 18 - 23; January, 1986, p.18 - 23; February 1986, p. 14 - 19; March 1986, p. 14 - 20; April 1986, p. 16 - 23; June 1986, p. 22 - 32; August 1986, p. 44 - 53; October 1986, p. 52 - 62, 66; January 1987, p. 24 - 32; April 1987, p.46 - 53; January 1988, p. 22 - 29. 11. Oakeshott, R. Ewart, The Archaeology of Weapons (New York: Frederick A. Praeger, 1960). This work has been available as a reprint since 1994, published by Barnes & Noble. 12. Petersen, Jan, De Norske Vikingesverd (Kristiana: Jacob Dybwad, 1919). 13. Pleiner, Radomir, The Celtic Sword (Ox ford: Clarendon Press, 1993). 14. Sachse, Manfred, Damascus Steel (Düsseldorf: Verlag Stahleisen, 1993). 15. Thålin-Bergman, Lena, "Blacksmithing in Prehistoric Sweden," in Karin Calissendorff, et. al., Iron and Man in Prehistoric Sweden (Stockholm: Jernkontoret, 1979), p. 99 - 133. 16. Tylecote, R.F. and Gilmour, B.J.J., B.A.R.British Series 155: The Metallography of Early Ferrous Edge Tools and Edged Weapons (Oxford: B.A.R., 1986). 17. Williams, Alan R., "Methods of Manufacture of Swords in Medieval Europe: Illustrated by the Metallography of Some Examples," Gladius 13 (1977), p. 75 - 101. 18. Ypey, Jaap, "Frühmittelalterliche Waffen mit Damast," in Damaszenerstahl: Vorträge der 1. Fachtagung über "Damaszenerstahl - Stahlgewinnung und Stahlverarbeitung in der vorindustriellen Zeit" (Fachausschussbericht 9.008) (Düsseldorf: Verein Deutscher Eisenhüttenleute, 1983), p. 5 - 31. Copyright ©1997 by D. A. Oliver. Reprinted from the catalogue of The Fourteenth Park Lane Arms Fair.